Americans overwhelmingly say that parents should be able to take leave from work following the birth or adoption of a child. And they say the same about workers who need to care for a family member with a serious health condition or to deal with their own serious health condition. But while most Americans support paid leave in each of these situations, about one-in-seven (15%) say men shouldn’t be able to take paternity leave at all, paid or unpaid, according to a new Pew Research Center study. By comparison, just 3% say women shouldn’t be able to take any type of maternity leave, while 5% say workers shouldn’t be able to take leave to care for an ill family member and 2% say they shouldn’t be able to take leave to deal with their own health problems. Older adults, particularly older men, are the least supportive of fathers taking time off from work after the birth or adoption of a child. In fact, roughly three-in-ten Americans ages 65 or older (28%) – and 36% of men in this age group – say fathers should not be able to take paternity leave, compared with 16% of Americans ages 50 to 64 and about one-in-ten of those 30 to 49 (10%) and 18 to 29 (9%). Views also vary across party lines, with Republicans and Republican-leaning independents – especially those who describe their political views as conservative – more likely than Democrats and Democratic-leaning independents to say men shouldn’t be able to take time off after the birth or adoption of a child. About a quarter of conservative Republicans (26%) say this, compared with 13% of moderate or liberal Republicans, 11% of moderate or conservative Democrats and 9% of liberal Democrats. Older Republicans offer considerably different views than their younger counterparts. Four-in-ten Republicans ages 65 or older say fathers shouldn’t be able to take leave from work following the birth or adoption of a child, compared with 20% of Republicans ages 50 to 64, 10% of those 30 to 49, and 14% of those 18 to 29. Age differences are relatively small among Democrats. Views about paternity leave are tied, in part, to attitudes about gender and caregiving. Overall, somewhat more Americans say that, aside from breast-feeding, mothers do a better job than fathers caring for a new baby (53%) than say mothers and fathers do an equally good job (45%); just 1% say fathers do a better job than mothers caring for a new baby. 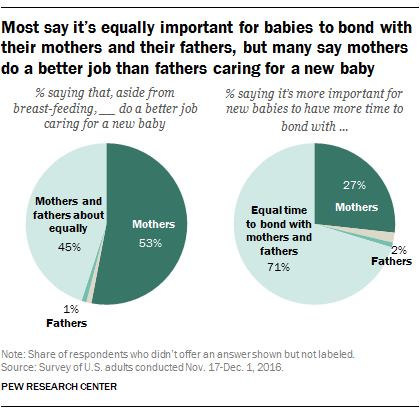 Still, most (71%) say it’s important for a new baby to have equal time to bond with their father and their mother, while about a quarter (27%) say it’s more important for a baby to have more time to bond with their mother and just 2% say having more time to bond with their father is more important. The view that fathers shouldn’t be able to take either paid or unpaid leave from work following the birth or adoption of a child is more common among those who see mothers as better at caregiving. For example, among Americans who say that, aside from breast-feeding, mothers generally do a better job than fathers in caring for a new baby, 20% say fathers shouldn’t be able to take paternity leave. This compares with 8% of those who say mothers and fathers do an equally good job. Similarly, those who say it’s more important for a new baby to have more time to bond with their mother than with their father also are more likely than those who say a new baby should have equal time to bond with both parents to say that fathers shouldn’t be able to take paternity leave (29% vs. 9%). Significant differences remain even when controlling for factors such as gender, age and political ideology, which are associated with support for paternity leave as well as with attitudes about gender and caregiving. The Pew Research Center study also finds that fathers take considerably less time off from work after the birth or adoption of a child than mothers do. Among those who have taken parental leave in the past two years, the median length of leave for fathers was one week, compared with 11 weeks for mothers. Parents consider many factors when deciding which parent will take more time off from work after the birth or adoption of a child. Among those who were living with a spouse or partner who was also employed at the time – and who say their spouse or partner didn’t take any time off, or that one took more time off than the other – a majority (69%) say they took into account which one needed more time to recover physically. About half say they considered who had more flexibility at work (50%), who had more generous leave benefits (45%) and who would do a better job caring for a new child (45%). About four-in-ten say that which partner wanted to take more time off (40%) or who earned more money (35%) were deciding factors, while 22% say they took into account who was more focused on their job or career.